Simply gorgeous! A non-stop riot of fall colours greeting us each day ever since we planted these dazzling Alternanthera ficoidea plants as ground covers in our garden beds last March! Being in tropical Malaysia, we do not have the joy of watching the autumnal turning of the leaves, so colourful plants such as Joseph’s Coat, Croton and Coleus, to name a few, that provide a spectacular show of ever-changing foliar variegation give us much pleasure. A big thank you to our lovely friend, Theresa Cheong, who presented us with numerous cuttings taken from her garden as seen in the left image. 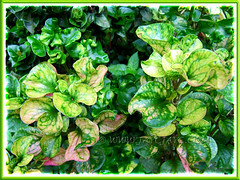 She must have observed my excitement over their unique multi-hued foliage the previous evening and sensed my longing! We found that the tip cuttings root easily in the ground and grow quickly too without much fuss. How marvelous! Not surprising that Parrot Leaf and its many other common names were assigned thus in reference to its bright and attractively coloured foliage that also resembles the vibrant plumage of the parrot. 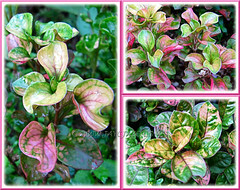 Alternanthera ficoidea is grown exclusively for its beautiful variegated foliage that comes in a wide range of attractive shades, shapes and forms. A heirloom plant since the Victorian era and now popularly grown throughout the world as landscape plants or carpet-bedders in home gardens, botanical gardens and parks, etc. for its non-stop vibrant and appealing colours. Origin: The Caribbean and Mexico to Argentina in South America. 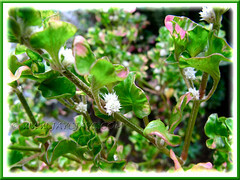 Features: Alternanthera ficoidea, belonging to the genus Alternanthera which consists of about 80 herbaceous plant species, is a fast-growing tropical herb with height between 15-60 cm (0.5-2 ft) or more and an equal spread. It is low-growing, usually with a compact and carpeting habit. It has slender, weak and moderately branched stems that are decumbent to erect, mildly pilose (covered with soft and fine white hairs) and bearing opposite leaves at internodes spaced 2-10 cm between. Leaves of the species plant is green, elliptic to broadly ovate. However, over the many decades, more A. ficoidea hybrids and cultivars with bright and colourful variegated foliage have surfaced to make these plants popularly sought by gardeners and landscapers alike. 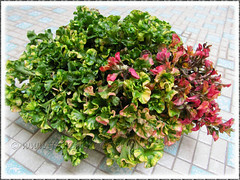 Now, the evergreen foliage comes in interesting and variable variegation. Leaves may be entirely of one shade or blotched with irregular patches of marvelous hues, ranging from pink to red and burgundy, white to cream and yellow, orange, brown, copper, purple and various shades of green. Besides, some leaves have attractive and contrasting venation that appears in many colours to further enhance their beauty. 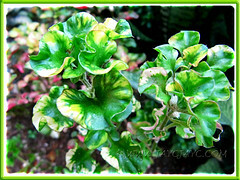 Simply amazing… each leaf is uniquely patterned, with a completely different random design! Leaf shapes and forms of Joseph’s Coat are as diversified. Shape can be broadly ovate, obovate, oblanceolate, narrowly elliptic or slim and pointed. Some leaves are simple while some have twisted and undulated margins, smooth-textured and glossy or puckered. A. ficoidea bears flowers all year round in the tropics but the off-white to cream-coloured subglobose blooms, often in clusters, sessile and held tightly in the leaf axils are inconspicuous and of no interest. Culture (Care): Alternanthera ficoidea or Joseph’s Coat grows easily and relatively easy to care for too. 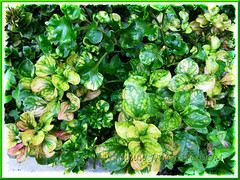 Light: Full sun to light shade or semi-shade, but best foliage colours are produced in full sun. Bleaching may occur in very hot and dry seasons. Moisture: Water moderately and regularly. Soil should not be excessively moist. Soil: Moderately fertile and well-drained soil. Others: Pinch back the growing tips and straggly stems or shear them periodically to keep plants compact and bushy or to create a uniformly compact and geometric shape. Feed once fortnightly with a balanced water soluble fertilizer for foliage plants. No serious insect or disease problems but watch out for caterpillars and spider mites. For subtropical and temperate regions: Hardiness: USDA Zone 10-11. It is a perennial in warm and frost-free regions. Being very frost-tender, Joseph’s Coat should be grown as a warm-season annual outdoors in affected regions, or alternatively, grow it in pots and bring indoors as houseplants or overwinter in a greenhouse. Water sparingly during the cold months and keep them in good light indoors. For the next growing season, take tip cuttings in late summer for overwintering indoors or from the overwintered plants to plant them out after the frost-free date in spring. If seeds are available, sow them at 55-64 deg F indoors in late winter. Propagation: By tip cuttings or stem cuttings that root easily and quickly. 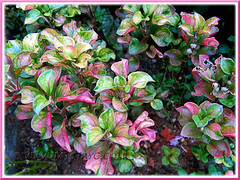 Usage: Being compact and low-growing, Alternanthera ficoidea with colourful variegated foliage, will be excellent as a ground cover, edging or bedding plant for borders or in containers, window boxes and terrariums. Bedding plants can be sheared into shapes to create eye-catching geometric carpet patterns in formal landscapes, gardens and parks. Mass the plants with differently coloured foliage for non-stop colour contrasts or grow them in front of taller flowering plants in garden beds for added interest. The cultivars with creeping or decumbent stems will be ideal for hanging basket specimens. 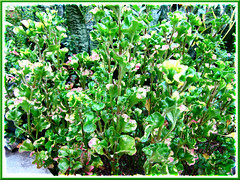 Parrot Leaf can be grown indoors as attractive houseplants too provided it received sufficient light and moisture. 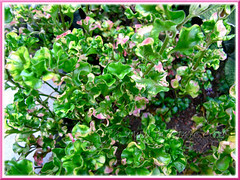 ‘Party Time’ – has green ovate leaves that are wavy and mottled with hot pink. 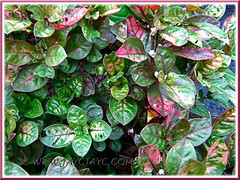 Some leaves though can be entirely green or pink. 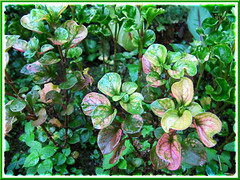 Where may I purchases seed of the Alternanthera; how much and how many seed per packet? Sorry, Michael. We’re just passionate gardeners and not retail sellers of gardening materials.